Recently, we came across this environment-loving community called the Green Village in Bali, the epitome of green living to be precise. 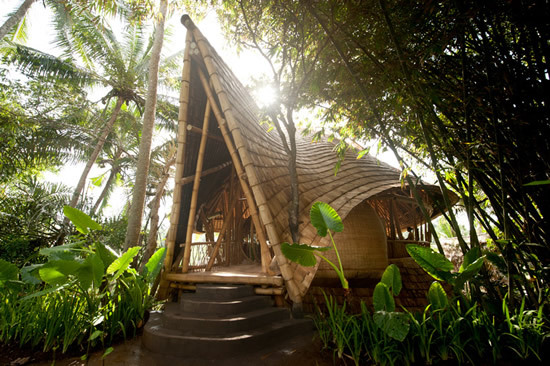 Built using a local architectural design called Ibuku, these houses are made from bamboo and assure high quality structures and life. Each built uniquely; these houses were built in conjunction with the Green School. Also, these homes aren’t designed like conventional urban residences, and are built to blend into nature. A beautifully green way to live, these bamboo homes provide residents with all the comforts they’d look for in a concrete and steel home! London has just welcomed home its first truly green and completely carbon neutral building. 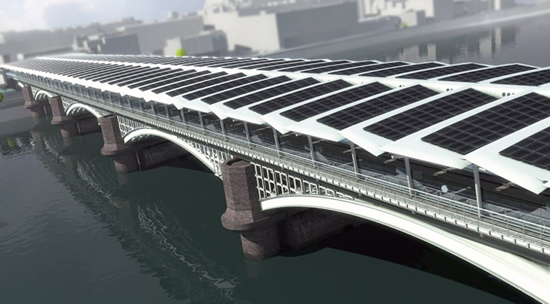 By the Nomura Group, a Japanese financial services company, this building located on the north bank of the Thames sports green roofs and solar panels and was designed by London-based Fletcher Priest Architects. Using 30% of the infrastructure from a former project on the same site in an attempt to reduce costs and building material, this five-storey office makes use of timber and packs a total floor space of about 800,140 square feet. Complete with a high-performance façade that makes optimal use of natural lighting and a lot of thought put into efficiency of water usage and electricity use, this swanky green building will pave the way for green architecture in the city of London. Our oceans today are being ridden with waste, particularly plastic and non-degradable materials taking to the sea. This in turn proves treacherous for the eco-system and marine life and destroys both gradually, having an adverse effect on the environment. Behold the SeaScraper, an architectural brainchild designed to keep our water bodies clean. 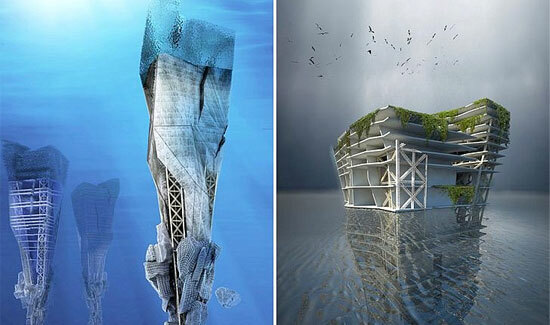 Structured like icebergs, these are largely submerged beneath the surface of the sea and use three separate zones to collect waste including a dedicated waste collection unit, recycling and energy recovery facilities in the middle and housing/recreational estates above sea level! An innovative way to clean up our oceans that could pretty much prove to be extremely practical if built sustainably, these SeaScrapers could do the eco-system a huge favor if they’re ever turned into a reality. PUMA seems to have taken a solemn oath of going green and to begin with, the company has just flung open the doors of its greenest store in India. 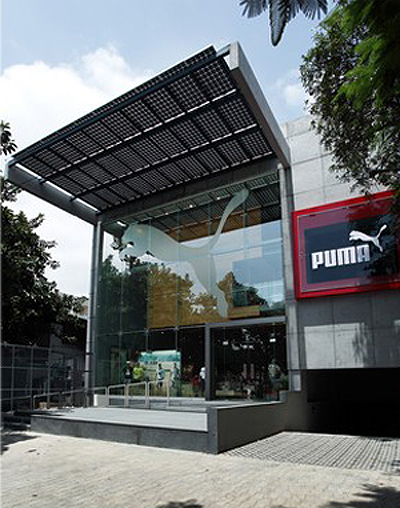 Located in Indiranagar, a suburb in Bangalore, this store spread over 800sqmeters sports a bunch of energy-efficient and eco-friendly elements and includes space for a retail area and a ‘PUMA Social Club’ cafe and bar. For its construction, the store has made use of recycled steel obtained from old DVD players, bicycles and lunch boxes and uses natural lighting to illuminate nearly 90% of store-space. That apart, this green store is 100% solar powered using photovoltaic cells generating nearly 10,384 kwh units annually and makes use of higher insulation levels, decreasing the need for air-conditioning. Dubai will soon play home to 340,000 square feet worth of pure green architecture, the first sustainable building to show up in the Emirates. Commissioned to be used by the water and civil division of the Dubai Electricity and Water Authority, this sustainable piece of modern architecture will generate nearly 600kW of solar energy on-site, which will be used by the building to reduce its complete reliance on grid power. 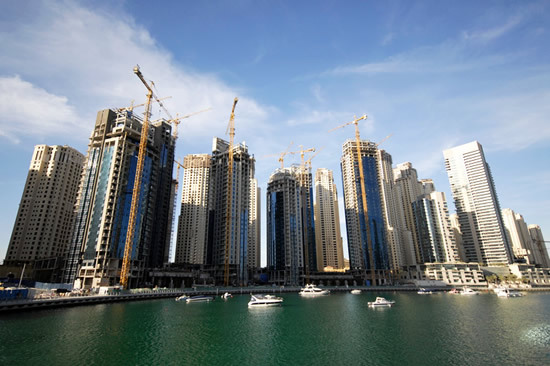 To be completed over the next few months, the building is located at Shaikh Zayed Road in Al Quoz and will make use of high efficiency insulation and smart building systems. Apart from this, the building will also make use of LED lighting technology and is termed as one of the greenest buildings in the Emirates! The recent calamity and energy crisis has been a blessing in disguise for many of Japan’s technology-oriented companies. Not that they made money out of it, but the setback has pushed them to develop and innovate new energy-efficient infrastructure. Shimizu Corporation, a large architecture, engineering and construction firm is one such company that has heightened awareness of energy efficiency and renewable energy. 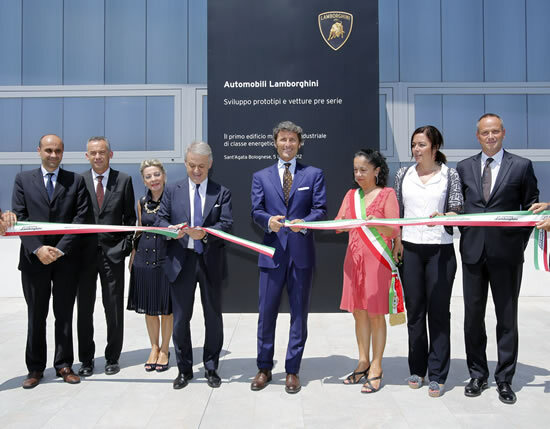 They recently opened their new headquarters which is dubbed as the least carbon-emitting building in the world. 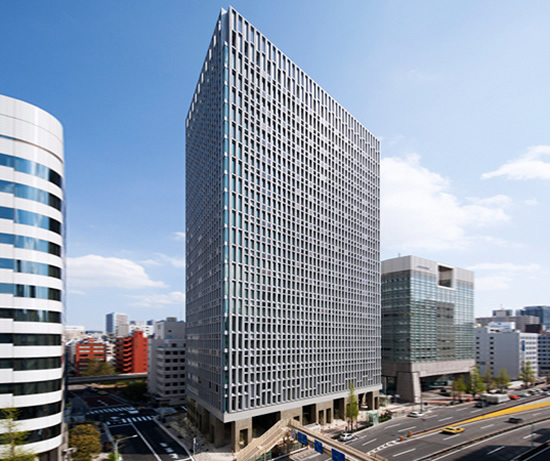 The Shimizu Corporation headquarters is projected to emit only 25 pounds per square foot of CO2 per year, which is 62% less than a regular Tokyo office building. 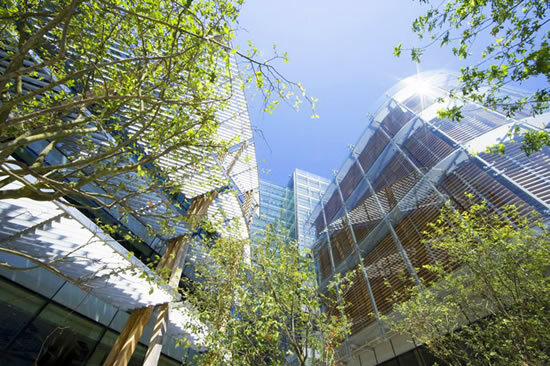 The building is incorporated with the HVAC system all throughout, reducing the carbon emissions by 30% compared to buildings with conventional HVAC systems. BMW sure knows how to show off the fruits of its labor and in an eco-friendly and energy efficient way! The German automobile manufacturer has recently unveiled the BMW Group Pavilion at the London Olympics that’ll have on display the carmakers latest automobiles with the Olympic Stadium and Aquatics Centre as the backdrop. The pavilion, bought to live by a renowned British architecture firm, is located on an elevated platform on the Waterworks River and has a flowing-water façade that’s more than just eye-candy. 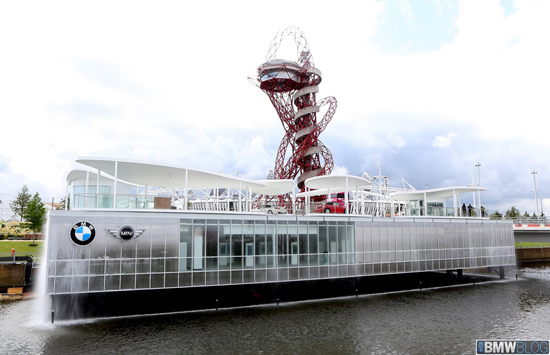 With interactive displays and the London Olympics fleet on display, the pavilion also has the BMW E-Scooter and the BMW i Pedelec concept along with the MINI Rocketman Concept on-stage alongside the BMW i3, i8 concepts. And that’s not all. Besides showing off a bunch of eco-friendly transport solutions, the pavilion also reuses and recycles the river water and is made from recycled steel with carbon-intensive building materials given a skip. green infrastructural developments in the near future. Doha, Qatar, has gone a step further to ensure a less-threatening carbon footprint and will soon play home to the one-of-a-kind building complex called Msheireb. What sets this one apart from the rest is the fact that this complex will sport the world’s largest collection of LEED certified buildings and will be built in preparation for the 2022 World Cup. 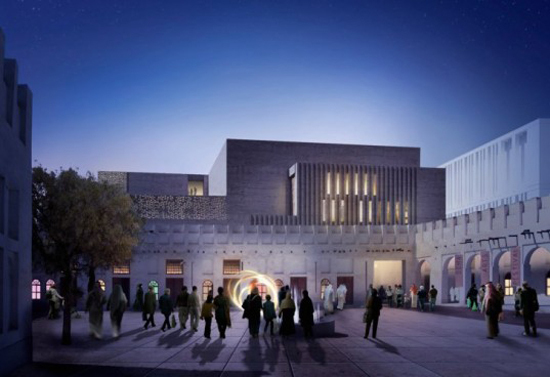 Spreading over an area of 31 hectares located in downtown Doha, the Msheireb complex will incorporate traditional Arabian architecture and modern-day green technology. Using smart grid technology, well designed alleys and streets that encourage wind circulation, thicker walls to keep home interiors cooler and a lot more, the Msheireb complex will soon be Doha’s crown jewel.